The species is distributed in continental Europe, Northern Africa, Urals, South-western Siberia, Asia Minor, Syria, Iran, Central Asia, and Himalayas. In Armenia, the subspecies L. m. orientalis Rühl,  - endemic of Transcaucasia is recorded, and inhabits wide variety of habitats including open grasslands and woodlands at the elevation range from 800 to 2200 m a.s.l., however selecting stony areas, or rocks and small cliff-like walls. Among host plants there are number of grasses listed, such as Poa, Dactylis, Glyceria, and Hordeum. The species gives two generations per year, and its flight period extends from early May till mid September. 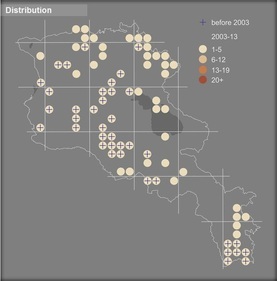 The species is slightly uncommon or even rare within typical habitat, however its broad distribution gives enough data for computation of population trend, which appears to be stable in the period of 2003-2013 (p>0.05). Most probably broad specialization towards larval host-plants allows species avoiding negative consequences of overgrazing, although its occurrence is clearly low in the heavily grazed and degraded habitats. The species is not included in the Global and National Red Lists, and is not included in CITES and Bern Conventions, however is included in European Red Book as Least Concern - the same status which is proposed for Armenia, after preliminary assessment. The current distribution range of Large Wall Brown is covered by number of Protected Areas and Emerald Sites, and it is presented in almost all Prime Butterfly Areas, so obviously there is no need for specific conservation measures, however taking into consideration its low density in degraded habitats, it is necessary to continue the species' monitoring aimed at early determination of population changes.